Editor’s note: As part of NextBillion Financial Innovation’s launch, we invited a number of top innovators and leaders to contribute their views on financial innovation – what’s driving it, where momentum is heading, and what obstacles remain. Today Tilman Ehrbeck, CEO of CGAP, explores why financial exclusion has persisted at the BoP, and how innovation is turning this around. The vast majority of poor people live and work in the informal economy. In economic terms, they are producers and consumers at the same time – not by choice, but by necessity. As such, they have to lead very active financial lives to create livelihoods for themselves, build assets, smooth expenditures and manage risks. The financial diary literature has documented this richly. But despite this activity, half of all working age adults globally – and more than three quarters of the poor – remain excluded from the formal financial system. Instead, they have to rely on age-old informal mechanisms to accumulate savings and capital: friends and family, the money lender, the pawn broker, the rotating savings club, and livestock that can easily die or be stolen. These informal mechanisms tend to be incomplete and unreliable, and they can be very expensive. Why is there a formal market failure at such scale? The obvious and most important reason is that it is very difficult to deliver formal financial services in an economically viable fashion at the very small ticket-sizes that are often required. You can’t collect high frequency, low denomination savings, say 20 or 25 cents every other day, when your average branch-based cash transactions costs are one dollar. Over the past decades, microcredit was the first financial service for the poor that managed economically viable delivery at scale, because the interest margin provided for enough revenue to cover the costs of the very labor-intensive business model. E-money based payment and quasi-deposit services only recently became viable in some developing markets with the deep penetration of cheap mobile telephony. Technology-enabled business model innovation that lowers transaction costs remains key to advancing financial inclusion. Another, more subtle reason is that service providers often do not understand the true underlying aspirations, constraints, behaviors and preferences of the base of the pyramid market that they aim to serve. Take school fees as an example: In many developing countries, public schools have failed families. Poor parents therefore make real sacrifices to send their children to private schools. Schools fees are a real cash-flow spike that is hard for them to manage. But it is not an unanticipated one. Why do many poor parents borrow money to pay schools fees, paying back the loan in subsequent months with steep interest, rather than saving up in the preceding months and earning some interest? I already acknowledged that it is easier from a business model perspective to provide credit rather than savings, but I also believe that the financial inclusion community did not spend enough time and energy to understand underlying needs, and therefore to develop truly responsive solutions. This is changing. The increasing availability of data allows for new pattern recognition. The financial services field is discovering human-centered-design approaches applied and refined earlier in other industries. Behavioral economics has made its way to the frontline of product development. Increasingly, not only business leaders but also policymakers and regulators are picking up on these developments to accelerate financial access for the poor – not based on how people ought to behave, but on what they actually do and don’t do. In Malawi, for example, Opportunity Bank observed that farmers had a hard time holding on to post-harvest cash, and often reached the next planting season without the required resources. Based on this observation, the bank developed a commitment savings product that allows farmers to lock away post-harvest payouts and distribute them over the year to smooth cash flows. The introduction of this product was accompanied by a so-called randomization impact evaluation. The effects were significant. Farmers with access to the new product managed their savings and cash flow better, and in the subsequent season used more agricultural inputs (+27.4 percent), had higher crop sales (+21.8 percent), and therefore the means for higher household expenditures (+17.4 percent) relative to a control group without such access. There are other such examples of behaviorally-informed product innovations. Green Bank in the Philippines also offers a SEED (Save, Earn, Enjoy, Deposit) commitment savings product, which enables clients to withdraw from the account only once their goal date or amount is reached. Jipange KuSave in Kenya has tested the provision of interest-free loans with a third of the amount held back as savings. And Bancomer in Mexico has developed a savings product that mirrors the savings behavior of low-income Mexican households, which literally use different cookies jars to separate savings for different future purposes. Some of the most interesting business model experiments are happening in South Asia, where population density allows for novel branch formats even in the low-ticket size environment of the base of the pyramid. The KGFS in India, for example, pursues a product-agnostic approach that starts with understanding the true financial picture of the household. Their frontline staff are called wealth managers, not loan officers. A thin, IT-supported branch infrastructure signals to the customer base that KGFS is “here to stay.” Janalakshmi, an urban–based MFI in Southern India, similarly is aiming to become the one-stop service provider for their most active customer segment. Global policymakers in particular in developing and emerging markets know that inclusive, local financial systems are an important ingredient for social and economic progress. They also know that they need to ensure stability for the system, and consumer protection – in particular for the more vulnerable. More than 35 countries have made a public commitment to financial inclusion, and formulated national strategies. Financial services providers at the base of the pyramid have arguably more tailwind than ever before to make a real difference by developing innovative new products and approaches that demonstrably help the poor improve their lives. 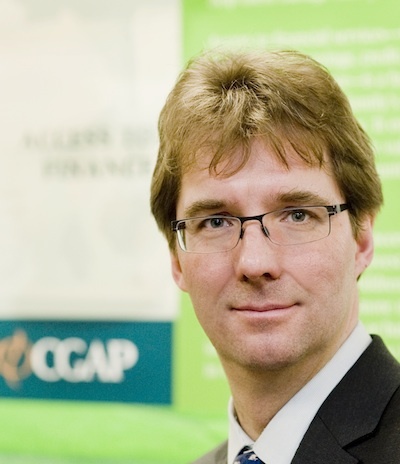 As CEO, Tilman Ehrbeck is responsible for the strategic direction and management of CGAP, a global partnership of over 35 development agencies, private foundations and national governments that share a common vision of improving the lives of poor people with better access to finance. CGAP develops innovative solutions for financial inclusion through practical research and active engagement with financial service providers, policy makers, and funders.